This next US domestic stock fund is one of the new funds offered by T Rowe Price. This T. Rowe Price U.S. Large-Cap Core fund has been awarded Top Mutual Fund for newcomer category by S&P. Details about the fund’s review can be found below. The T. Rowe Price U.S. Large-Cap Core investment fund objective is to achieve long-term capital growth. This US stock fund typically invests most of the net assets (>80%) in the stocks of large-cap U.S. companies, whose market cap is larger than the median market cap of companies in the Russell 1000 Index. This TRP fund expects to typically invest in approximately 50 to 75 companies. 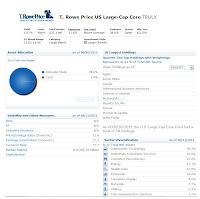 Jeffrey Rottinghaus is the lead fund manager of this T Rowe Price fund. He has been the manager since its inception in June 26, 2009. Since this fund is new, there is no Morningstar rating yet, but it is recognized as the top S&P mutual fund of 2011. This fund’s dividend yield is 1.07% and is distributed annually. Last year (2010), the dividend was $0.13. The annual expense ratio of this top fund is 1.15% comparable to the average in the Large Blend category (1.14%). The minimum initial investment for the brokerage account of this TRP fund is $2,500. There is no 12b1 fee and no front-end sales load fee. This fund is available for purchase from a limited of 17 brokerages. Last year (2010), the fund has recorded a return of 14.38%. The YTD return is -9.98%. 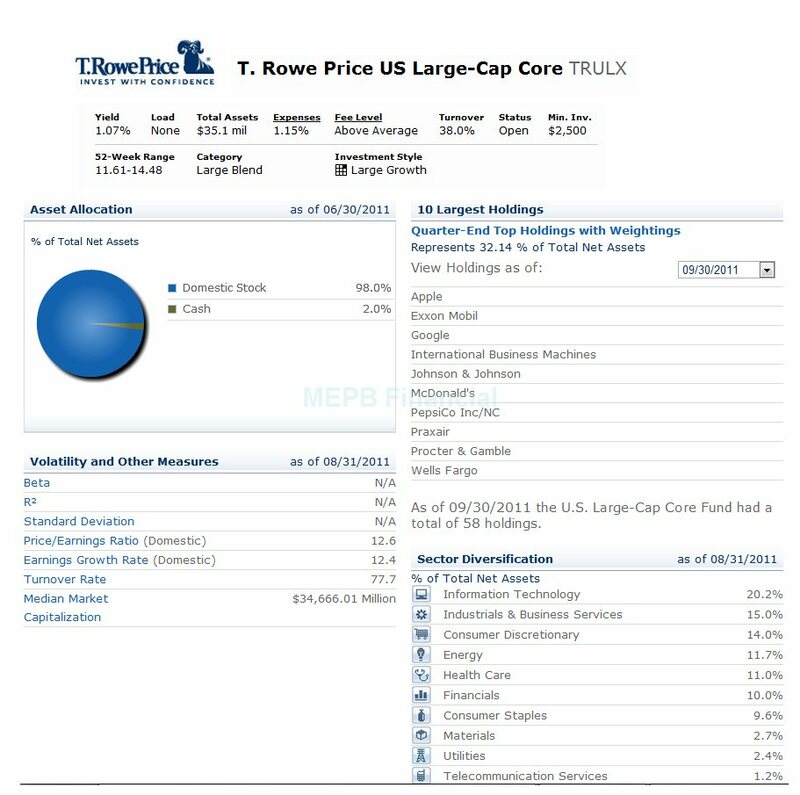 This TRULX fund has a total of 58 holdings as of September 30, 2011. The top 10 holdings are Apple, Exxon Mobil, Google, International Business Machines, Johnson & Johnson, McDonald’s, PepsiCo Inc, Praxair, Procter & Gamble and Wells Fargo. The top sector diversifications are Information Technology (20.2%), Industrials & Business Services (15.0%), Consumer Discretionary (14.0%), Energy (11.7%), Health Care (11.0%) and Financials (10.0%).